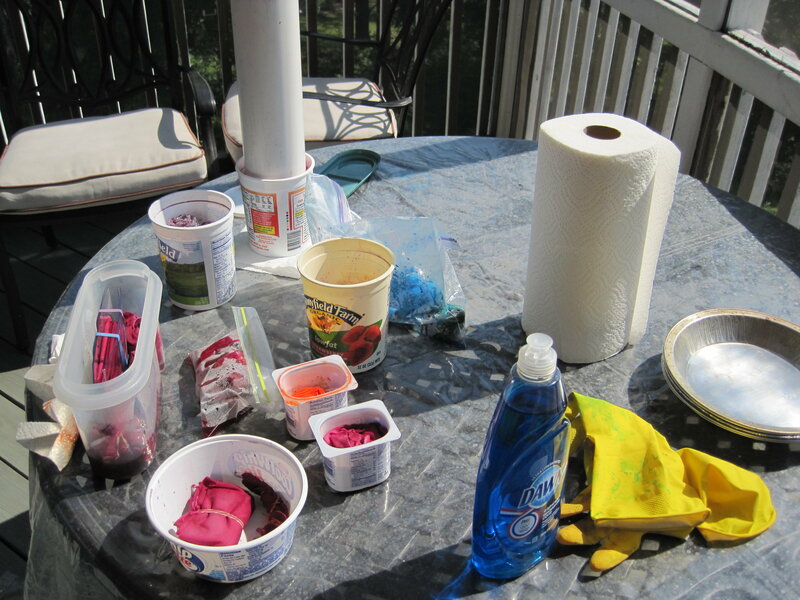 After waiting for the dyes to arrive and gathering all the supplies, I was finally ready to actually dye cloth. And I found the process has a distressing similarity to painting a room. You spend more time on the set up and take down than you do on the actual process. But, nothing daunted, a friend and I mixed up four dye colors – grape, turquoise, orange, and boysenberry – and got down to it. We used lots of rubber bands, plexiglass, bubble wrap, different folding techniques, shelf liner, sticks, and I don’t know what all to create patterns. And here’s what my cloth looked like before the wraps came off. I waited patiently for 24 hours for the dye to batch, and I don’t think I’ve been so excited about unwrapping stuff since I was 9 years old. Let me tell you how tricky it is to take off rubber bands when you’re wearing those yellow gloves. However, eventually they all got removed and I was left with the following finished products. I’m particularly taken with the patterns produced in the flag folded and accordiance pleated fabric. 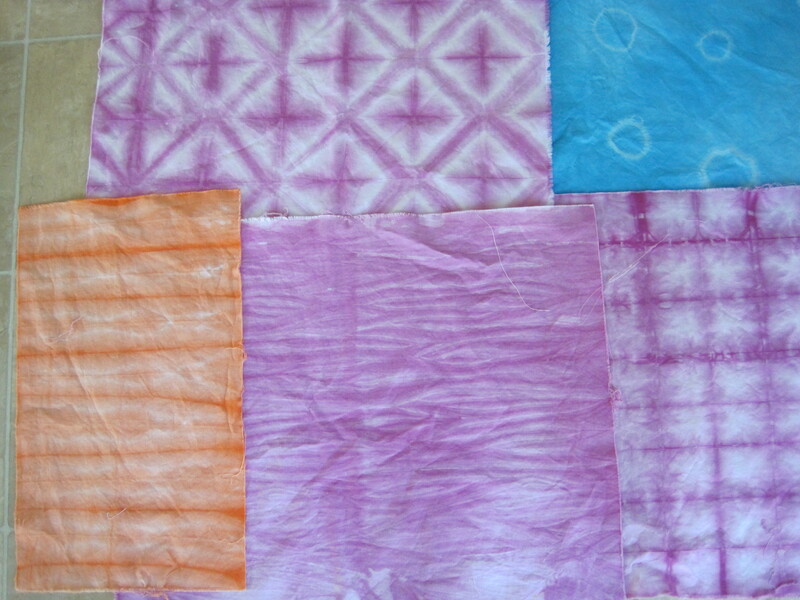 And here’s how my overdyeing of old linen towels came out. 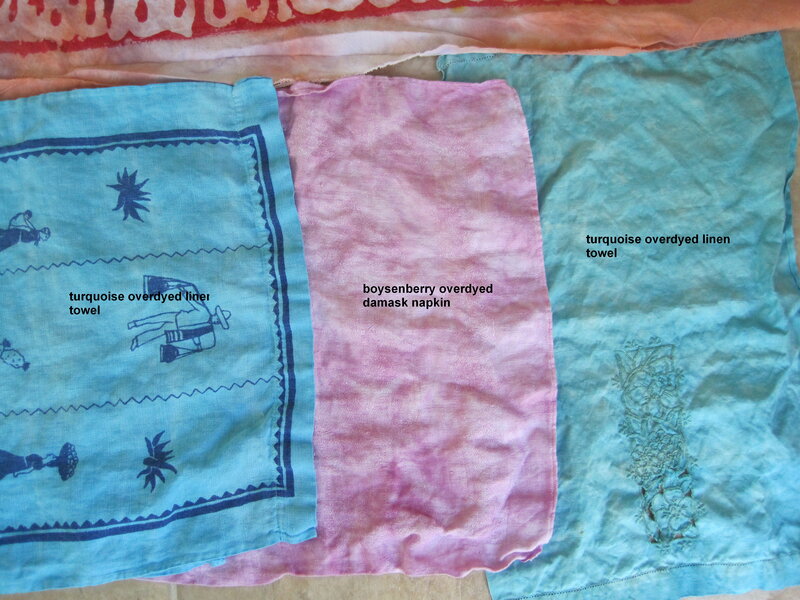 And finally I overdyed my old attempt at batiking. My son is now 22 years old, so I don’t think he’s interested in a batiked dinosaur. I was surprised at how light the dyes seemed to turn out, given how intense they looked before the rinse process. 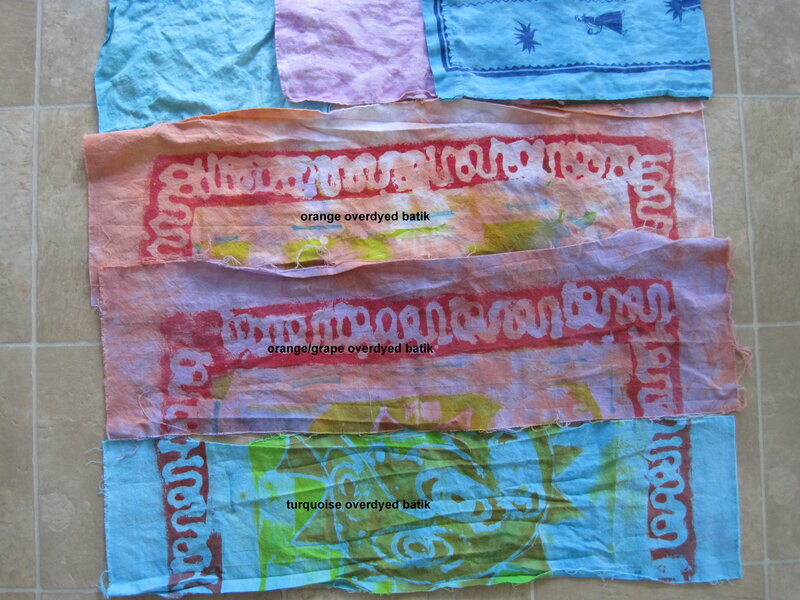 In the case of my repurposed fabric I suspect it may be that the towels are linen and the batiked cloth is a heavy cotton. However, I’m glad they turned out light so I can experiment with overdyeing in different colors. I’m set to try it out this coming week. Stay tuned.